Well, that was unforeseen. 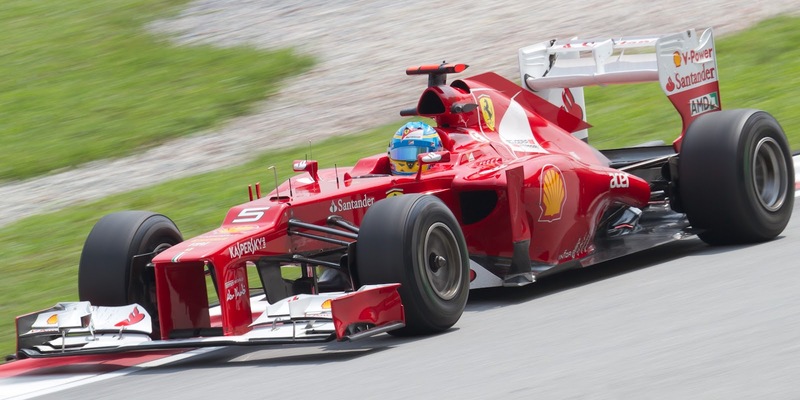 Today at Monza it looked for all the world that we'd have a titanic battle for pole position between Fernando Alonso and Lewis Hamilton, and it can't be denied that the squabbles of that pair have an additional edge that no other face-offs can match. But the prospect was rudely snatched away just as we prepared for the mighty final crescendo. 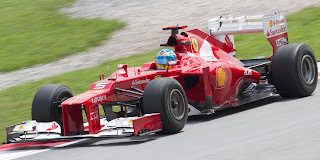 In the final, vital, qualifying segment Alonso's rear anti-roll bar failed on his first lap, leaving him only able to put in a token effort as well as to help his team mate with some slipstream. It all means he'll start the race down in tenth place. 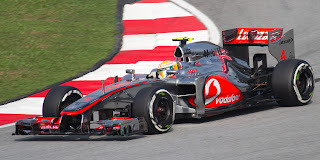 This in effect handed things to Lewis and McLaren, and Lewis indeed took the pole (with what by his own reckoning was only a 'half decent' lap) with his team mate Jenson Button completing a front row lock out for the Woking collective. This isn't to take anything away from either Lewis or McLaren, both driver and team have been right on it all weekend (continuing the team's strong recent form) and Lewis is showing that the considerable chat about his future isn't negatively impacting him on-track. But it can't be denied that Alonso would have been right in the mix at the very least. 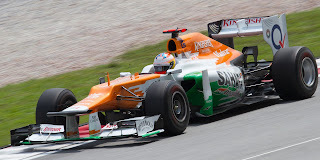 Indeed Alonso for one reckoned the pole would have been 'easy' for him and that the team was 'expecting' a 1m 23.5 lap, half a second quicker than Hamilton's best. Of course, in F1 there is always some potential for blarney, but the evidence of earlier in the session was that this wasn't an outlandish assessment. If nothing else we'd have had fun finding out how much truth there was in all of it. To think that just a week ago many were commenting that Alonso hadn't had any doses of bad luck this season. Well, following on from him being wiped out by a flying Romain Grosjean at the first turn at Spa last Sunday, make that two major doses of bad luck now for him. The McLarens are in perfect position to control the race though, and as mentioned alongside Alonso have set the pace pretty much all weekend. So up to a point it seems McLaren's race to lose. And Lewis has looked consistently to be the quicker of the two, though things might get interesting if Jenson beats him off the line tomorrow, just as he did in Melbourne. Felipe Massa starts third though, looks confident and will be doing his best to do his team and team mate a turn by acting as a spoiler. And just like last week Sebastian Vettel looks to be well on the way to be performing a 'save'. The Red Bulls have spent most of the weekend being seriously off the pace, which was confirmed in the qualifying hour. But Seb salvaged sixth (net fifth) on the grid from the wreckage, and the team is a bit more confident in the RB8's race pace. And he's ahead of the guy he's chasing down in the drivers' table. Not many saw that coming. And as is usually the case on a race day we can't count out Seb's badminton partner Kimi Raikkonen, who starts seventh and showed very good long run pace yesterday in practice. So, there's plenty of racing to be done at Monza tomorrow. And F1 in recent times has reminded us that nothing in this game can be taken for granted, no matter what the probabilities appear to be in advance. There's nothing Monza hasn't seen before.